GridScout™ | A tool for bulk collection of location data, including MGRS coordinates, to be used by intelligence analysts. Finally, MGRS search for Google Maps! 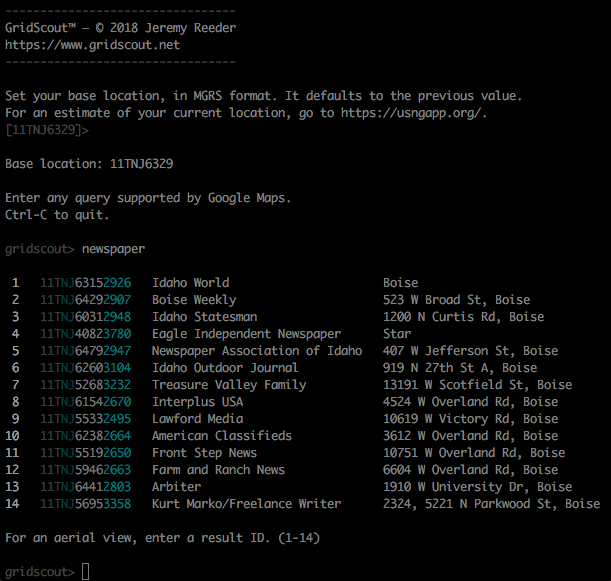 GridScout™ is the console-based Google Maps search tool that you didn’t know you needed. It’ll help you make better use of your paper maps. Without it, the process of finding and marking places of interest is tedious. Let GridScout™ solve that so you can get on with your duty of planning for the impending apocalypse, or whatever it is that you do. Order waterproof paper maps of your areas of interest. Have them printed with an MGRS (aka USNG) or UTM grid. Get some clear plastic overlays. Search for points of interest: “power plant”, “tank farm”, “distribution center”, etc. Select individual results to see aerial and street-level views as needed. Edit the GridScout™ search log (log/gridscout.log), removing any irrelevant search results. Using either the search log or the console output as a reference, plot points on the overlays. File the search log away for future reference. For its primary purpose of bulk collection of MGRS coordinates, simple text output in a terminal works well. But GridScout™ does integrate with Google Maps to give aerial views in your web browser. From there, you can easily access other online resources such as topographic and street-level views, courtesy of USGS and Google. Strictly speaking, however, these are not part of GridScout™. Going into battle dependent on vulnerable infrastructure is unwise. So yes, actual printed maps and overlays are advantageous. They work independently of power and communication grids. They’re durable, highly portable, and low-maintenance. Fancy technology has its place, but printed maps excel in the field. With GridScout™, you can apply the technology without the vulnerabilities. That is, it puts your computer and the Internet to good use now, and it helps you record on more durable media the information that you’ll need later. The Military Grid Reference System is a whole-world variant of the UTM coordinate system. It’s used by NATO militaries because it’s concise, minimizes distortion, and makes for easy math. Latitude and longitude are greatly lacking in these qualities. Map vendors such as MyTopo allow you to have your maps printed with a UTM grid, and for the aforementioned reasons I suggest that you take them up on that option. How do I get GridScout™? It’s on GitHub, where you’ll find installation instructions. And it’s free! Searches go through Google. They are encrypted so that only you and Google can read them. They’re associated with whatever Google account you choose to use when you create a Google Places API key. If you require complete anonymity, then create a Google account that is not associated in any way with your actual identity. Then use it only in public places like libraries and coffee shops, and only while wearing a mask; or use an anonymous VPN service such as ProtonVPN or Tor, which will conceal your location with less trouble. Lastly, when setting your base location, don’t use your exact actual location unless you’re okay with Google knowing it. Truncate your coordinates to 10-kilometer precision if you like, or set a base location on the other side of town; your search results won’t be drastically affected. Aerial views are accessed through Google Maps. 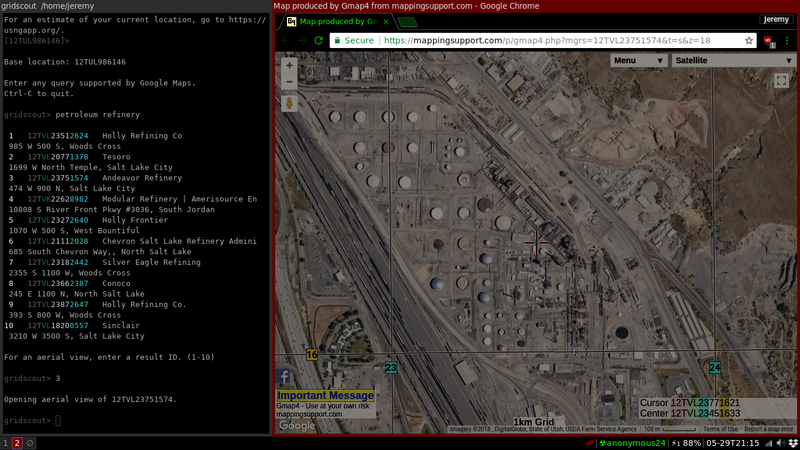 When you access the aerial view of a location, your web browser will submit that location’s MGRS coordinate in an encrypted manner. Depending on your network and the configuration of your browser, it may be possible for Google to determine your actual location regardless of the base location that you used for your searches. If this is a serious problem for you, then simply locate each search result on your MGRS-compatible paper maps. Who are you, and why did you create GridScout™? My name is Jeremy Reeder. Professionally, I’m a network security analyst and a part-time bank-vault engineer. I take an interest in the security of my home and my community, so I make a point of protecting them as well. In the past I have volunteered as a firefighter, a home security advisor, and a range safety officer. You may wish to protect your own home and community. I suggest that you work together with others around you who share this goal. Such a group may be called an emergency response team, an emergency service, a posse, or a militia. For more community-defense volunteer ideas, go here. I created GridScout™ to help me in my role as a community defense analyst for my local battalion of Idaho’s unorganized militia. I share it to help the people of other communities in the development of their own defense intelligence. You can reach me at jeremy@gridscout.net. To encrypt the conversation, use ProtonMail or an OpenPGP-based email client. Here’s my public key. How can I learn more about defense intelligence? For an overview of the topic, including some good examples of how your maps and map-related information could come in very handy, read the article How to Build an Area Study for Emergencies and Community Security, courtesy of Forward Observer. GridScout™ Blog is dedicated to the proficient defensive use of MGRS maps, GridScout™, and other tools well suited to the goals of GridScout™. Site icon, made by Freepik from flaticon.com, is licensed under Creative Commons BY 3.0. All other content © 2018 Jeremy Reeder. Use and distribution are subject to the terms of the MIT License.